Chicki and I have had cattle for approximately 20 years consisting of mainly crossbred cattle and exotic breeds (Gelbvieh). High veterinary bills, excessive forage costs, and calving and maintenance problems consistently plagued us. In 2002, we decided to make changes in our cattle operation. I challenge you to talk to any longhorn breeder and they will tell you they have more pictures of their longhorn cattle than they have of their children or grandchildren. They are always enthusiastic about showing you their herd and the babies. Stay as long as you want but just talk about longhorns! 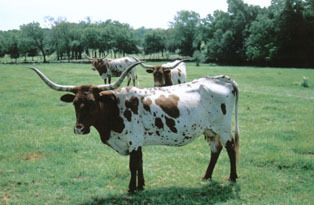 On a cold Saturday in February 2002, Chicki and I selected 11 Joshua daughters (a cross of King Daughters and Joshua—a grandson of Bail Jumper) bred to MESHACH from Joe and Debbie Assad (Assad Longhorn Kat-El Co.) We later purchased MESHACH at the Washington County 2002 sale in Brenham, Texas. Since then we have witnessed first hand the 18-year breeding program of Joe and Debbie Assad; we are enjoying the beautiful and correct longhorn babies.